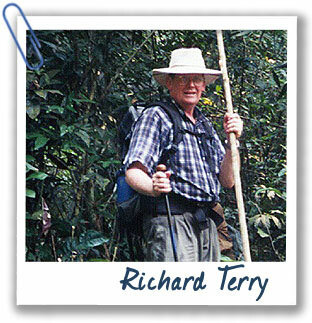 Richard Terry applies his knowledge of soil science to unlock mysteries of ancient civilizations. How did you get into soil science? When I was a kid, I wanted to be an astronaut, a geologist, an archaeologist, and a geographer. Through soil science I’ve gotten to do nearly all of these things! What does soil have to do with archaeology? I started out working with archaeologists and geographers in Piedras Negras, Guatemala. They were studying an important ancient Mayan city deep in the jungle. I developed a portable lab that we could carry in a duffle bag into the jungle. We were collecting samples to figure out how much phosphorus was in the soil. Phosphorus is a nutrient found in vegetables, and a clue that tells us where the Maya disposed of their food waste. Later, we started looking for heavy metals, which are evidence of ancient metal workshops and paint pigments. The Maya loved to paint buildings red. The pigments used in ancient times were made from iron oxide and we can find traces of this in the soil. What is the most exciting thing you’ve found? We found iron in soil where the Maya were making mirrors for the King of Aguateca in Guatemala. The Maya used iron pyrite to make the mirror that he wore on his chest.